Stephanie Frey (St. Paul, MN) is an illustrator and educator. Her illustrations highlight the ordinary moments of her day to day life. Viewers will see themselves and their own lives as she draws attention to the importance of acknowledging simple daily interactions and internal thoughts. Stephanie’s artwork has been included in Design Mom, Cordella Magazine, Illozine, Graze Magazine, Murphy Square Quarterly and others. Lanesboro Arts presents an Emerging Artist Exhibition Group Show featuring the art of seven talented artists working in a variety of media: Peyton Woller, Mary Beth Magyar, Jovan Speller, Stephanie Frey, Emma Knapp, Anna Segner, and Kristin Maija Peterson. The show opens with a reception featuring all seven artists on Saturday, February 3, 2018, from 5-7 p.m., and runs through April 7. The reception will include wine and hors d’oeuvres, as well as live jazz guitar by musician Kelly Blau. Always free and open to the public, winter gallery hours are Tuesday-Saturday 10 a.m. – 5 p.m. The artists were selected in a jury process for the 4th annual Emerging Art Show at Lanesboro Arts. A Saint Paul, MN based artist that earned a BFA in Illustration at the College of Visual Arts, Stephanie Frey employs simple lines, flat colors, and humor to give a simple object or portrait a new perspective. 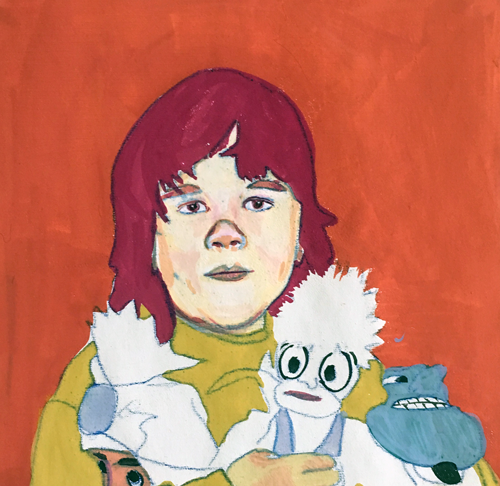 Utilizing ink drawings, gouache paint, digital images and found images, her artwork currently centers around telling stories through observations of her own personal world and found images. Many of her images highlight an urban landscape though the ordinary moments of her day-to-day life. For the series of work to be featured in the Lanesboro Arts Emerging Artist Exhibition, Frey searched through found images and magazines to find images of happy times and celebration with smiling and dancing and then used gouache to flatten areas, enhance areas, or shift the focus of the image. I have a small painting at the Red Wing Depot Gallery in March. Four of my small gouache paintings were selected for this exhibit. Opens with a reception on March 9, 6 - 8 p.m.